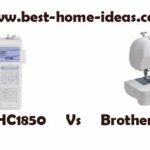 Brother CP-7500 is a highly rated beginners sewing machine. But you will have to find some alternatives, if new machines are not available. Brother CP-7500 is very unique in its design. 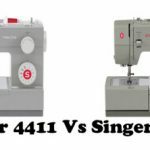 It doesn’t follow the same design pattern you see on other Brother machines. It has been a popular model in U.S, but recently it seems to have disappeared from online stores. It isn’t officially discontinued yet (at the time of writing this review). Still, it is hard to find new ones on sale. In that case, I would suggest you to go with Brother CS6000i which is very similar in specs. 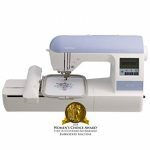 It is also the best beginners sewing machine in the under $200 price category. 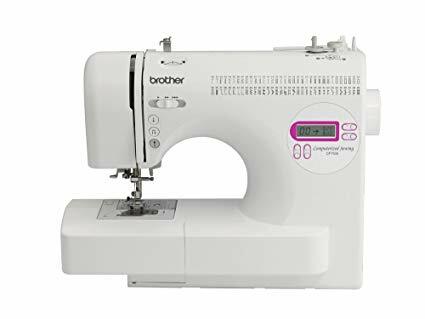 Brother CP-7500 features 70 built-in stitches, 110 stitch functions and 7 one-step buttonholes. Stitch selection is computerized and you can view and adjust the stitch settings with the help of LCD screen. Selection buttons are conveniently placed. Automatic needle threader is provided for easy threading. Bobbin is top drop-in type and that too with a transparent cover over it. The clear cover makes it easy to monitor bobbin thread supply. Automatic bobbin winder is also there. Being a computerized sewing machine, Brother CP-7500 features a start/stop button and variable speed control. 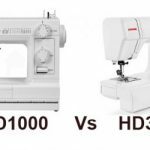 With those features, you can sew without using the foot pedal. 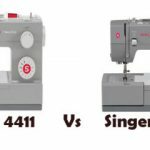 You just need to select the sewing speed that works the best. You can set the stitch width to a maximum of 7mm and length up to 5mm. This machine is capable of sewing at a maximum speed of 850 stitches/min (which is pretty much the standard for all beginners machines). A button is provided for reverse/reinforce stitches. One cool feature is the programmable needle up/down, which is a very important feature if you are a quilter. It is like having an extra hand while pivoting. The machine comes with an oversized wide table for large projects. Free-motion quilting option is also available on CP-7500. An accessory storage compartment is built-in for easy storage. The machine switches to free arm, once you remove the storage compartment. The machine is one of the lightest in the price range, weighing just 10.1 pounds. It comes with 25 year limited warranty. It comes with a hard cover as well. Whether this machine is discontinued or not, it still is one of the easiest machine to set up. The instructions are very easy to understand. It has a very well written user manual. Brother CP-7500 is a user-friendly machine. Beginners will have no difficulty in operating this machine. There are a good variety of decorative stitches on-board. All the computerized features work as expected. It is one of the lightest machine I have ever come across, but it is still heavy enough to prevent vibrations. The stitch quality is pretty good. It works well on all kind of fabrics. The built-in LED bulb is not bright enough, you will have to rely on exterior lighting. The spool pin looks flimsy. Brother CP-7500 would definitely be a good choice for those who don’t want to spend a lot of money on a beginners machine. It will fit all the needs of a beginner at a very good price point. The only issue is that, new CP-7500’s are hard to get. If you can’t get a new one, the best bet is to go for Brother CS6000i, which is an excellent beginners machine. It has similar specs and also features in our elite list of ‘Machines You Can Buy With Your Eyes Shut’.